I love my trips to Los Angeles with my wife. There is more to see, do, experience, and photograph there than anyone can do in a lifetime. Everyone knows that the Los Angeles area is a bustling, humanity-filled part of the world. But what can be surprising is that, just like any other place, there are times and places where it can be rare to see another soul. It’s always good advice to seek out things to photograph that haven’t already been photographed countless times already. But some things are photographed so often for good reason. 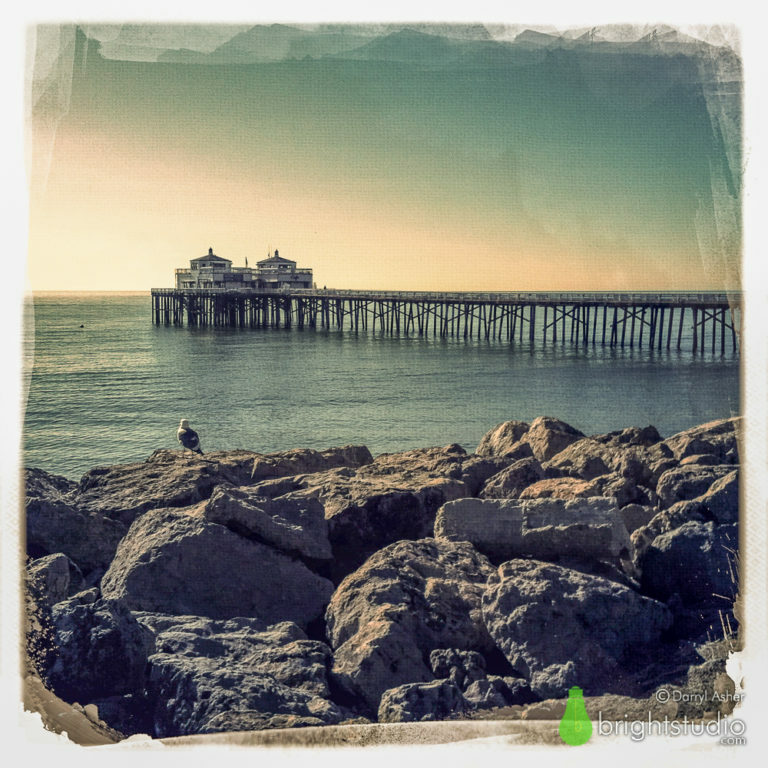 The Malibu Fishing Pier is a landmark, and I wanted to take my picture of it. It was early on a quiet Sunday morning. The flat water was of no interest to surfers. There were only a few other people in sight, and even the notoriously hectic Pacific Coast Highway more resembled a quiet country road. My wife and I walked up and down the pier and enjoyed the Pacific breeze. On this trip, I was shooting a lot with the Hipstamatic app on my iPhone and I lined up this shot as a seagull landed to take in the same view. Available in the shop as a 13×13 inch print, produced with archival, museum-quality materials. It’s the Print of the Month for August, available at half price.